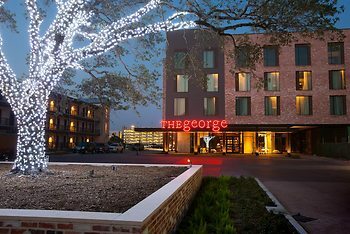 The George Hotel, College Station, United States of America - Lowest Rate Guaranteed! With a stay at The George, you'll be centrally located in College Station, within a 10-minute drive of Texas A&M University - College Station and Texas A&M Bonfire Memorial. This 4-star hotel is 0.9 mi (1.5 km) from Benjamin Knox Gallery and 1.5 mi (2.4 km) from Albritton Bell Tower. Location; style in hotel; breakfast; staff attitude. It would be improved by having a computer and printer in the lovely conference room. Location was very good. Bar staff, excellent. The lobby was comfortable and huge. I enjoyed the restaurants as well. The cool design of the place, the bars and restaurants and outdoor entertainment. No way. Everything was great! Totally enjoyed our stay. We really liked the location and area aminities. The whiskey bar! Everything was perfect, the location was near everything we needed, the rooms were awesome. The staff was very friendly. The only thing bad was that the restaurant was not ready yet, but we managed.